When you want to go fast on a run, it�s important to get just the right trim for your sails and your boat. But that is not enough. Perhaps the most critical ingredient for downwind speed is finding the correct wind angle to sail. Locating the best angle is not so difficult when you�re sailing upwind. The closehauled �groove� (the heading that gives you optimal performance to windward) is fairly well-defined and stays pretty much the same even as the wind increases or decreases. The front of your jib gives great feedback about whether you are sailing too high or too low. And there are many other clues to help you find the best closehauled angle, including the tug of windward helm, a steady angle of heel, and the constant feel (and angle) of breeze on your face. Almost all of these things are missing when you sail downwind, however, and that makes the downwind �groove� less well-defined. On a run, you must choose from among a wide range of angles to sail, and this makes it harder to know whether you are steering the best course possible. 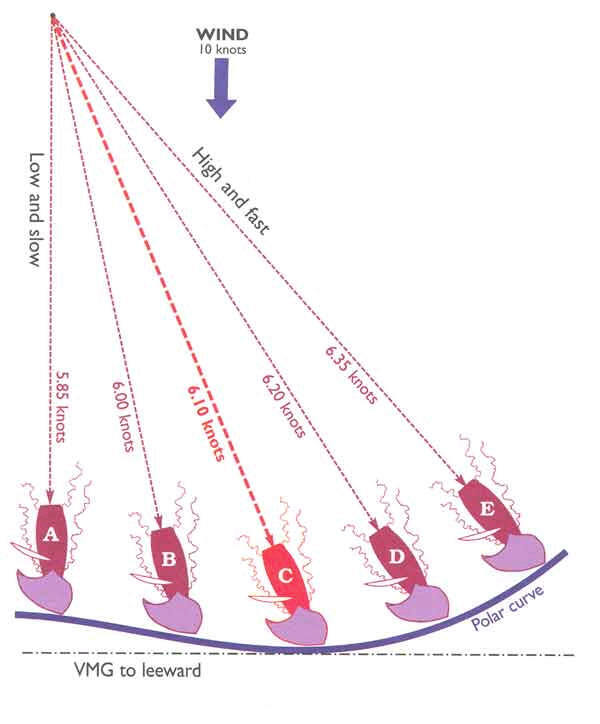 In addition, your ideal sailing angle changes more frequently and dramatically when you are sailing downwind. 1. �Feel� your boat - As Bill Murray says in Caddyshack, a comedy about golf, you must �be the ball.� In sailing, try to be the boat. Almost every top sailor is very good at �feeling� his or her boat when racing. They are able to use their senses of touch, balance, sight and sound to know how fast the boat is going through the water, how much pressure is in the sails, how far the boat is heeled, how much helm there is, and so on. If you want to feel your way to the best angle downwind, you must be able to judge subtle changes in speed and angle. If you can bear off slightly without losing much speed, then that is probably a good thing to do. Likewise, if you can head up a little and increase your speed noticeably, you are probably going in the right direction. The helmsperson and spinnaker trimmer (if you have one) must be able to see and sense the amount of wind pressure in the sails since this will help you find the optimal angle. If you feel increased pressure in your spinnaker, for example, you can probably bear off. Less pressure means you should head up. Of course, you shouldn�t rely entirely on your senses, even if you�re the world�s best sailor. your ultimate goal is not sailing the boat so it feels right, but beating the other boats. It would not be useful to set up the boat so it feels good but goes slower than the boats around you. That�s why you must rely on other clues as well. When you're sailing downwind, you have a choice of many different course to steer. You can sail low slow (A), high and fast (E), or anywhere in between. You can go faster by sailing a higher angle, of course, but this also means you will be heading farther away from the leeward mark. For any boat and wind condition, there is usually one combination of boatspeed and wind angle (C in this graph) that will give you the best VMG (velocity-made-good) to leeward. Unless you need to go high or low for tactical/strategic reasons, you should always try to find this optimal combination of speed and angle when you're running. 2. Check other boats - Since your primary goal is to beat the competition, don�t get your head stuck inside your own boat. It doesn�t really matter how good or bad your boat �feels�, as long as you are performing relatively better than you competitors. In fact, sometimes when the boat feels �bad� you may actually be doing quite well. Watching the other boats is especially helpful for figuring out which angle is best to sail downwind. Pick one course and sail this for a while, watching your performance compared to near by boats. Are you sailing higher or lower than them? How is your speed through the water? Which boat is making the best VMG to leeward? Then sail a little higher or lower and see what happens. Does this new angle improve your VMG relative to the other boat(s)? Keep experimenting until you find the angle that gives you the best relative performance in the existing wind velocity. While you are going fast, try to remember how the boat and sails look and feel. 3. Instruments - If your boat has the luxury of instrumentation, this is another resource to help you find the optimal angle downwind. By displaying your VMG to leeward or your downwind target speed, you can figure out pretty quickly which true wind angle will give you the best performance. By tuning in the the feel of your boat, the relative performance of other boats and your instruments, you have at least three different ways to help find your best downwind angle. In the ideal world, use as many of these as possible and don�t rely on just one. Once you find a good angle for going fast downwind, don�t just sit back, relax and open up the cooler. 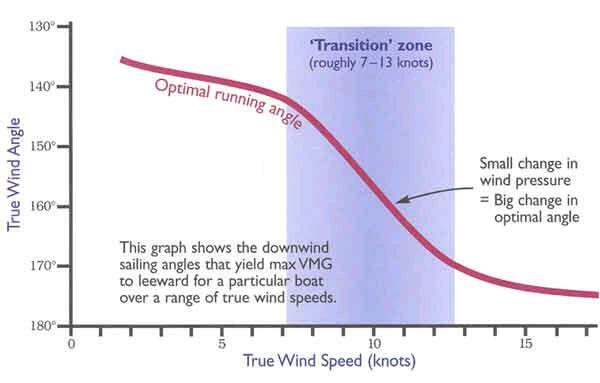 As I mentioned before, your optimal angle is very sensitive to changes in wind velocity, especially if you are sailing in the �transition� range of 7 to 13 knots of wind (see diagram above). Since the wind is always changing, you must keep your head out of the boat and be ready to sail higher (in a lull) or lower (in a puff) to maintain your best VMG. When I�m sailing upwind, I always try to point a little higher without losing speed. Downwind I always try to sail a little lower. Lower is good (in most situations) because it takes you more directly toward the leeward make. However, you have to be careful that you don�t get going too slowly. Don�t even think about sailing lower unless your boat feels good (i.e. you�re relatively fast with the sails pressured up). Then bear off slowly (adjusting your sails accordingly) until you just start to feel the sails lose pressure and the boat slow down. At that point, head up again to maintain your speed. While you are searching for the right angle, make sure to check your performance against that of nearby boats. Some boats like to sail high, especially in light air of planing conditions, while others go faster dead downwind, or even by the lee. The only way to know which is better is to try different things and keep evaluating. On a run, the angle you sail to maximize you VMG to leeward depends a lot on wind velocity. In heavy air it�s fast to sail almost dead downwind, while in light air you must sail a lot higher. However, this relationship is not linear. In the lighter (under 7 knots) and heavier (over 13 knots) wind ranges, changes in wind speed have only a modest impact on your ideal sailing angle (see graph). In the middle range, however, a small increase or decrease in wind speed can change your optimal sailing angle significantly. When you are sailing in this �transition� zone, you must be very sensitive to changes in the wind - otherwise you will be sailing at a less than optimal angle and speed.